An exercise program for seniors 50 yrs. and over. Meets four times a week in the Center/Arena. (Check the bulletin for times.) A social gathering or speaker on health topics follows the exercise routine once a month on Tuesdays and Thursdays. Held on Fridays during the season of Lent. An important fundraiser for the Knights of Columbus and Men's Club. These evenings provide good food and opportunities for socializing. Contact Knights of Columbus or Men's Club. 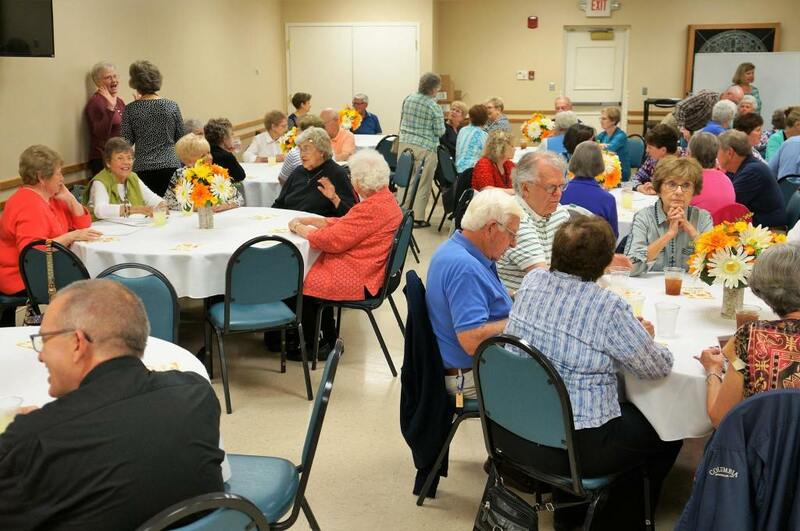 The Golden Group's Mature Adults mission is to provide a venue and environment in which the senior members of the parish can gather in a social setting to interact on subjects of interest to people that age. Meets Monday, 10:00 A.M. in the Joseph Room. A wonderful ministry that provides an intimate and safe atmosphere where mothers gather to find encouragement, instruction, prayer time and caring friends. It is an opportunity for moms to know Jesus in a personal way and to share feelings about motherhood — its frustrations as well as its great joys. Babysitting is provided for a small fee. 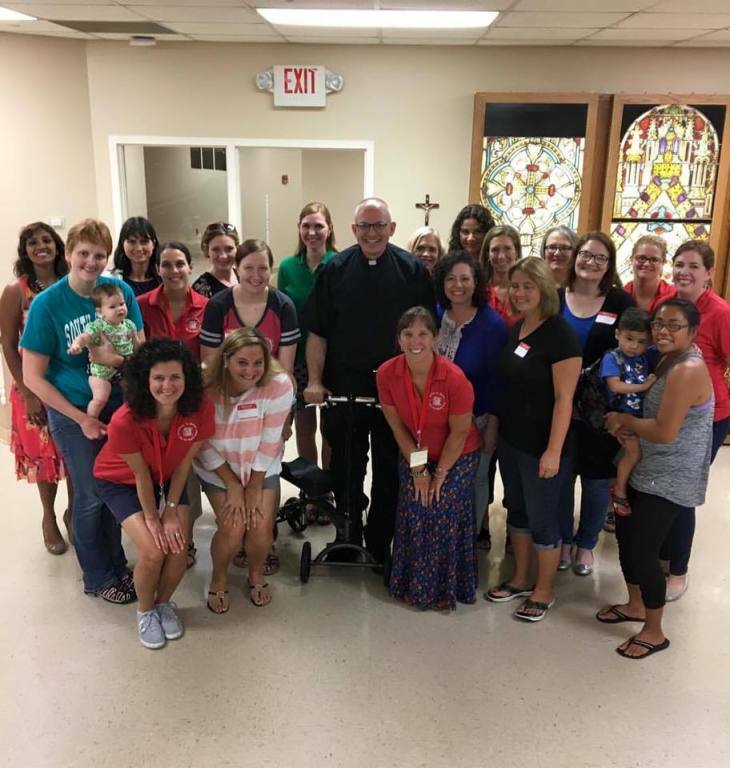 Meets the 1st and 3rd Thursdays of the month, 9:00 A.M.-11:00 A.M. Playgroup meets twice monthly (time varies) and a Mother's Night Out is planned monthly. This group is comprised of beginning and experienced quilters who gather each Tuesday morning, 9:00 A.M. They quilt for individuals and for the parish. Some quilts are used as prizes for the Summer Social. Proceeds from quilting for individuals is gifted to the parish. Annual fundraiser of the Men's Club. Typically held indoors in the summer in the air conditioned Arena of the School. A limited number of tickets are sold to this event, with the last raffle ticket drawn being the big winner. Tickets are $100 and include food and beverages for two, and one entry into the Reverse Draw. VBC is for children age four by August 1 through those entering grade six. Usually a week-long event in early June from 8:15 A.M. - 11:45 A.M. daily. The Gospel message literally comes alive through active learning and fun activities. Puppets, drama, music, play and snacks come together in a concentrated one-week program. For more information contact Marty Horning at (812) 490-1000. Youth & Young Adult Ministry - refer to link on home page.